Below are some summaries of selected recent publications, written for non-experts. These highlight some of the range of research done by the group. The LIGO Scientific Collaboration also puts together science summaries, written for the general public, for all their publications. The Matter-wave-laser Interferometer Gravitation Antenna (MIGA) instrument is now being developed in the underground tunnels of a decommissioned nuclear missile silo in south-east France. The hybrid atom-laser antenna will employ two 200 m long optical cavities to simultaneously interrogate several atom interferometers. Light pulses resonating inside the cavity will act as beam splitters and mirrors for matter waves. The interferometric signal is linked to the phase of the cavity field that is imprinted on the atoms during each pulse, as well as the local acceleration experienced by the atoms. 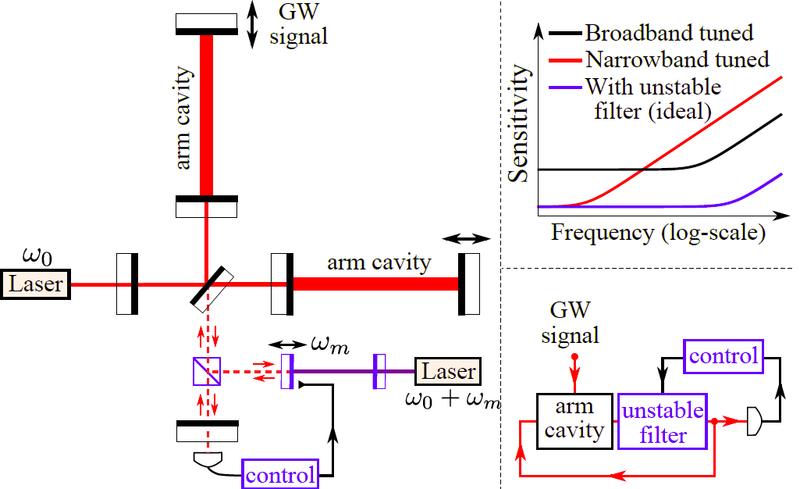 The antenna is therefore sensitive to any effect modifying the optical path length in the cavity, such as the strain induced by a passing gravitational wave. MIGA will be used to measure gravity at a large scale, as well as a demonstrator for low-frequency gravitational-wave detection using atom interferometry. In its initial configuration, the peak strain sensitivity will be 2e-13 at 2 Hz, limited by atom shot noise. Running an atom interferometer inside an optical cavity provides key advantages over using a high-power laser system. 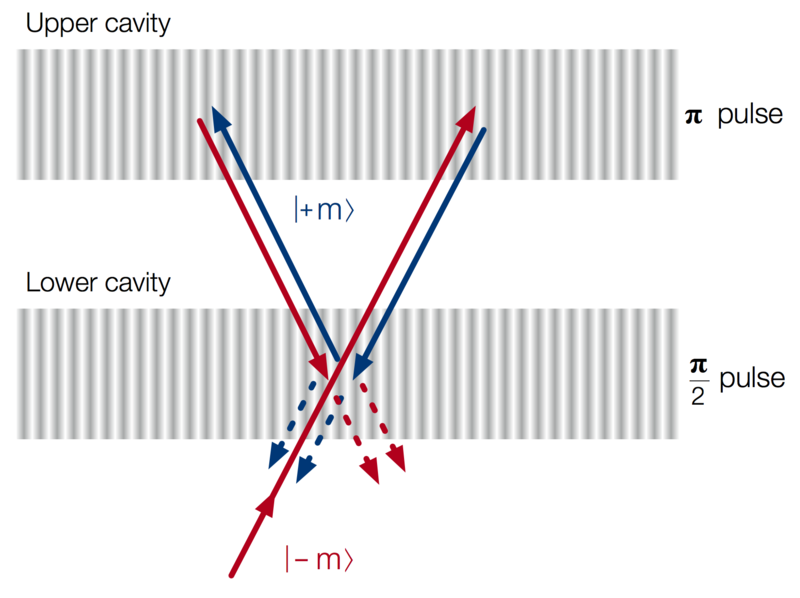 The cavity can enable the transfer of large amounts of momenta to the atoms by providing both power enhancement and spatial filtering of the interrogation field, which will enhance the sensitivity of the interferometer. However, it presents some challenges, particularly in experiments planning to use very long cavities. 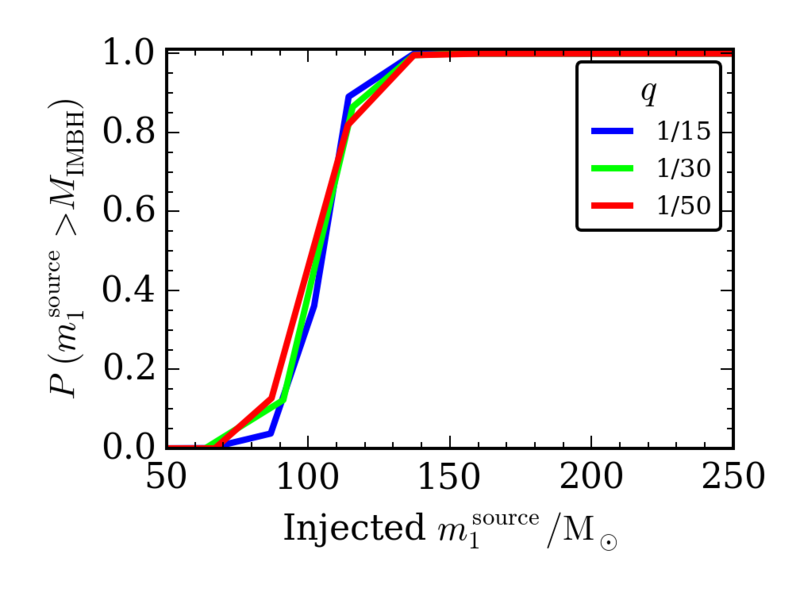 The design of the cavities for the MIGA interrogation system was aided by the atom-optics model developed in our group, which includes the deformation suffered by the interrogation pulses in the time domain due to the cavity’s large photon storage time relative to the duration of the injected pulses. Our model helped us establish design constraints for the cavity parameters with the aim of maximising the performance of the interferometers. Localizing the source of gravitational waves has many applications: it is essential if we want to search for multimessenger counterparts (as for GW170817), or if we want to cross-reference with galaxy catalogues in order to estiamte the Hubble constant. This work explains how to (quickly and accurately) convert the output of our analysis of gravitational-wave signals into smooth probability distributions describing the three-dimensional location of the source. To reconstruct the probability distributions, we use a Dirichlet process Gaussian mixture model, a technique which has been used in computer vision, but is not (yet) common in astronomy. The same technique can be used for more general applications, other than just three-dimensional locations. Looking at simulated binary neutron star results for early Advanced LIGO and Virgo runs, we explored how well sources can be localized. Adding more detectors to the network helps a lot, as it narrows down the possible sky locations. However, improving the sensitivity of the detectors means that we can detect sources further away, and this means the typical localization volume gets much larger. Following up on these signals will be a challenge! Fortunately, the best localized sources are really well localized: for a three-dector network similar to what we had during our second observing run, about 8% of sources could be pinned down to a single galaxy. Authors: Del Pozzo, W., Berry, C. P. L., Ghosh, A., Haines, T. S. F., Singer, L. P. & Vecchio, A.
Gravitational waves give us a unique insight into the properties of binary black holes. The information from gravitational waves should help us figure out how these black holes form—in this paper we investigate exactly how accurately we will be able to determine details of binary evolution. We consider populations of binary black holes simulated using COMPAS, and how sensitive the distribution of chirp masses and merger rate (which will be measured through gravitational waves) are to changes in the input physics. 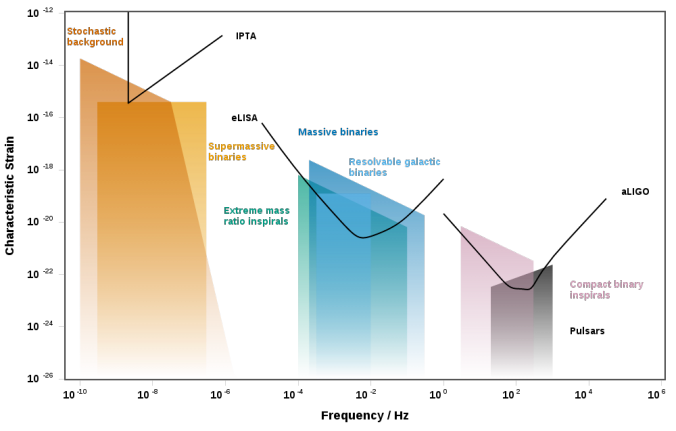 In particular, we consider four of the most uncertain parameters: the supernova kick (σkick), the common-envelope efficiency (αCE), and the mass loss rates during the Wolf–Rayet and luminous blue variable phases (fWR and fLBV). We quantify the information we can gain from observations using the Fisher matrix, which includes correlations between parameters. 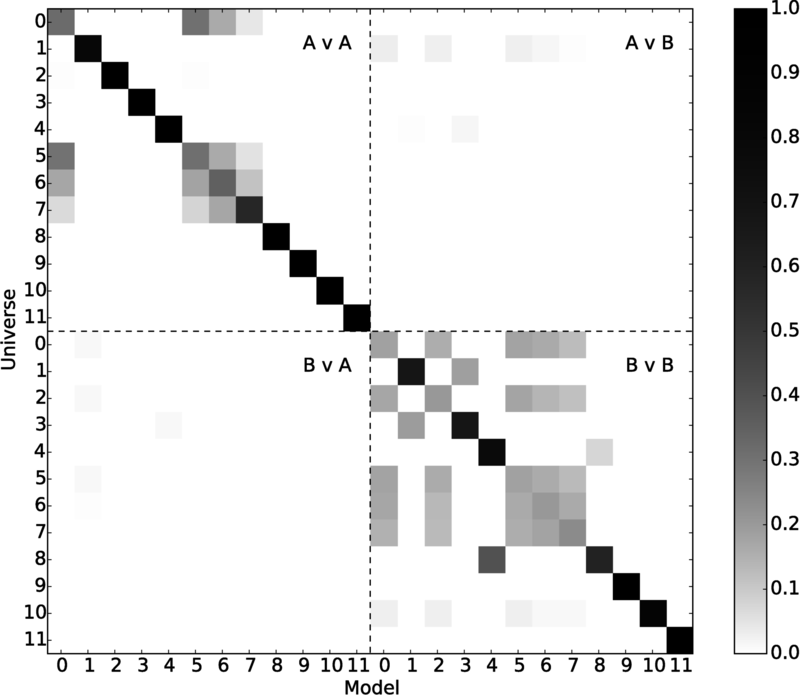 The plot on the left shows (fractional) measurement uncertainties for many realisations of the binary black hole population after 1000 observations (the uncertainties scale inversely with the square root of the number of observations). We find that we can distinguish populations which differ by just a few percent in these parameters! The measurements are much better when adding in the chirp masses as well as the rates, so perhaps adding in more information from gravitational-wave (or other complementary) observations will improve things even further. Authors: Barrett, J. W., Gaebel, S. M., Neijssel, C. J., Vigna-Gómez, A., Stevenson, S., Berry, C. P. L., Farr, W. M. & Mandel, I.
LIGO recently detected gravitational-waves from 4 likely mergers of black holes. As LIGO detects more and more black hole mergers, we will be able to start learning about how binary black holes form. Here we study one possible fingerprint of binary black holes formation—the angles between the black holes' spins axes and the direction perpendicular to the binary's orbital plane. Two possible families of ways to form a binary black hole exist: 1. The evolution of a pair of stars away from anything else (isolated binary evolution). This predicts that the tilt angles are typically small; binaries are said to be aligned. 2. Formation through many dynamical encounters in a dense stellar environment such as a globular cluster. In this case, black holes typically have their spins misaligned with the orbit. We show that with as few as 5 detections we could confidently distinguish between the extreme cases of all binary black holes forming through one of the two channels, assuming black holes spin reasonably rapidly. With around 100 detections we will start to be able to measure the fractions of binary black holes forming in each way (assuming that there is a mixture). The animation (left) shows how the measurements for a mixture of four different models (λ1, λ3 and λ4 are the fractions for models of isolated binary evolution with different assumptions about the amount of misalignment, and λ2 is the fraction for dynamically formed binaries). Authors: Stevenson, S., Berry, C. P. L. & Mandel, I.
Interferometric gravitational wave detectors like LIGO use suspended optics and high laser power to ensure high detector sensitivity. One consequence of this is that the resulting radiation pressure is able to push on the mirrors, coupling the laser light to the natural vibrational modes of the mirrors. The light reflected from the mirror is distorted depending on how the mirror surface vibrates, and will have a different behaviour to the undistorted light. In some cases, the new pattern of light is resonant in the interferometer: we get a feedback loop which can act to amplify or suppress the mirror motion. We describe this using the parametric gain R, where R > 1 means that the mirror is ringing up (distorting more). We call this case a parametric instability (PI). PIs can saturate the control systems of the detector, limiting our observation time. Mitigation schemes have suppressed all the PIs that we have see so far, but as we continue to improve the detectors (increasing the laser power) we expect to see more PIs: we will need to improve our mitigation schemes. In our paper, we model PIs in the full Advanced LIGO design, focusing on the role of the power- and signal-recycling cavities (PRC and SRC), and how these shape the response of the detector. The figure (left) plots the parametric gain of one example mechanical mode in four cases: 1. A single LIGO arm cavity; 2. The Michelson interferometer with both Fabry-Perot arm cavities (FPMi); 3. The FPMi with power recycling (PRFPMi); 4. The full Advanced LIGO design configuration, with dual recycling (DRFPMi). We see that the optical response changes from a single broad peak to a set of peaks, with regions of high gain and suppression. Each step in the animation plots all four cases for different choices of SRC tuning, &straightphi; (where &straightphi; = 360° would correspond to a length change of 1 wavelength). This shows that the mechanical mode will be amplified or suppressed depending on the tuning of the SRC. We study this behaviour for a set of 800 vibrational modes. We find that the total number of unstable vibrational modes, and how quickly they will ring up, changes depending on properties of the SRC. Therefore, if we make changes to the recycling cavities in the future, we will need to adapt the mitigation scheme to suppress the different parametric instabilities. Authors: Green, A. C., Brown, D. D., Dovale-Álvarez, M., Collins, C., Miao, H., Mow-Lowry, C. & Freise, A. The space-based detector LISA should be able to detect a range of different types of sources. Extreme-mass-ratio inspirals (EMRIs) form when a stellar-mass black hole orbits around a massive black hole, slowly falling inwards as gravitational waves are emitted. EMRIs occur in the centres of galaxies, where massive black holes are surrounded by dense clusters of stars (and stellar-mass black holes). We are not exactly sure of the properties of these massive black holes and their surrounding clusters, how they form and evolve, and therefore how many EMRIs LISA will detect—the number of EMRIs will be able to tells us something about this physics. The paper explores the range of possibilities; for a variety of different assumptions about the population of massive black holes and their clusters, we calculated the EMRIs LISA could observe. We find that there is a large range: from 1 to 2000 detections per year. Crucially, even with the most pessimistic assumptions, we should be able to make at least one detection over a multi-year mission lifetime. 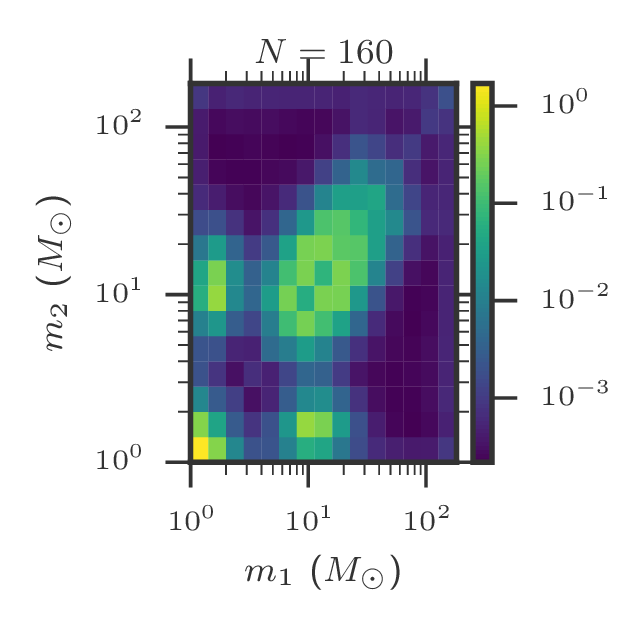 The plot of the left shows the fraction of EMRIs that are detectable at different redshifts for a range of massive black hole masses for one of our models. The EMRI signal may last for several years, over which we observe tens of thousands of orbits. These long and complicated signals encode of lot of information about their source, allowing us to make precise measurements. We estimated measurement accuracies for our different EMRI populations. Unlike the number of detections, these are pretty much always the same. We will be able to measure the mass of the massive black hole to about 10%, and its spin to about 0.1%. These mean we will be able to build up a detailed picture of the population of massive black holes, and also check that they have the properties of black holes expected in general relativity. Authors: Babak, S., Gair, J., Sesana, A., Barausse, E., Sopuerta, C. F., Berry, C. P. L., Berti, E., Amaro-Seoane, P., Petiteau, A. & Klein, A. During its first four months of taking data, Advanced LIGO detected gravitational waves from two mergers of pairs of black holes (GW150914 and GW151226), as well as third potential black hole merger candidate (LVT151012). In order for the black holes to merge within the age of the Universe by emitting gravitational waves, they must start out close together by astronomical standards: no more than about a fifth of the distance between the Earth and the Sun! However, massive stars (the progenitors of black holes) expand to be much larger than this during their lifetimes. How can we then fit such large stars within very small orbits? Several possible scenarios have been proposed to address this. 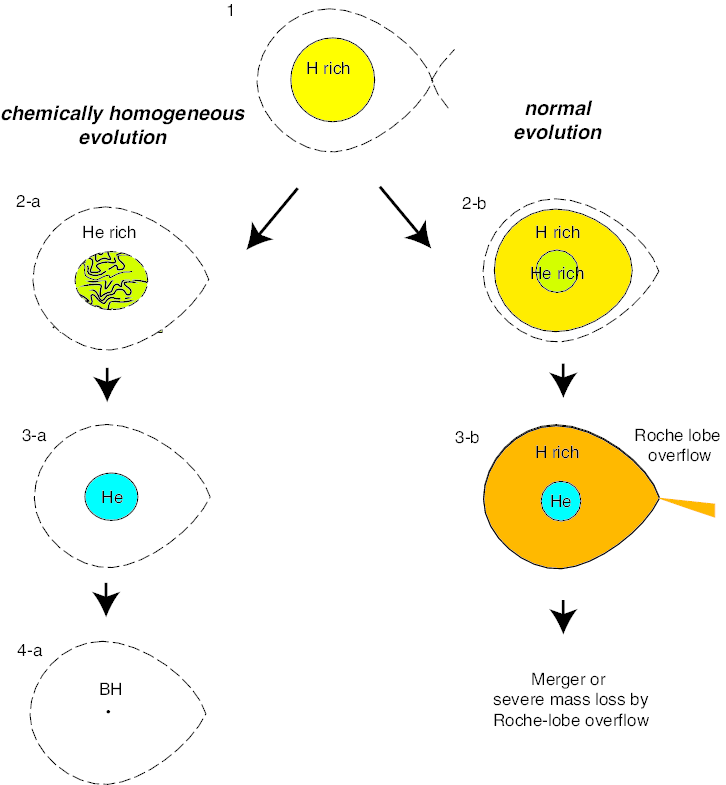 We have have shown that all three observed events can be formed via the same formation channel: isolated binary evolution via a common-envelope phase. In this channel, two massive stars start out at wide separations. They interact as they expand, engaging in several episodes of mass transfer; the latest of these is typically a common envelope—a rapid, dynamically unstable mass transfer that envelops both stellar cores in a dense cloud of hydrogen gas. Ejecting this gas from the system takes energy away from the orbit, bringing the two stars sufficiently close together for gravitational-wave emission to be efficient, right at the time when they are small enough that such closeness will no longer put them into contact. The whole process takes a few million years to form two black holes, with a possible subsequent delay of billions of years before the black holes merge and form a single black hole. 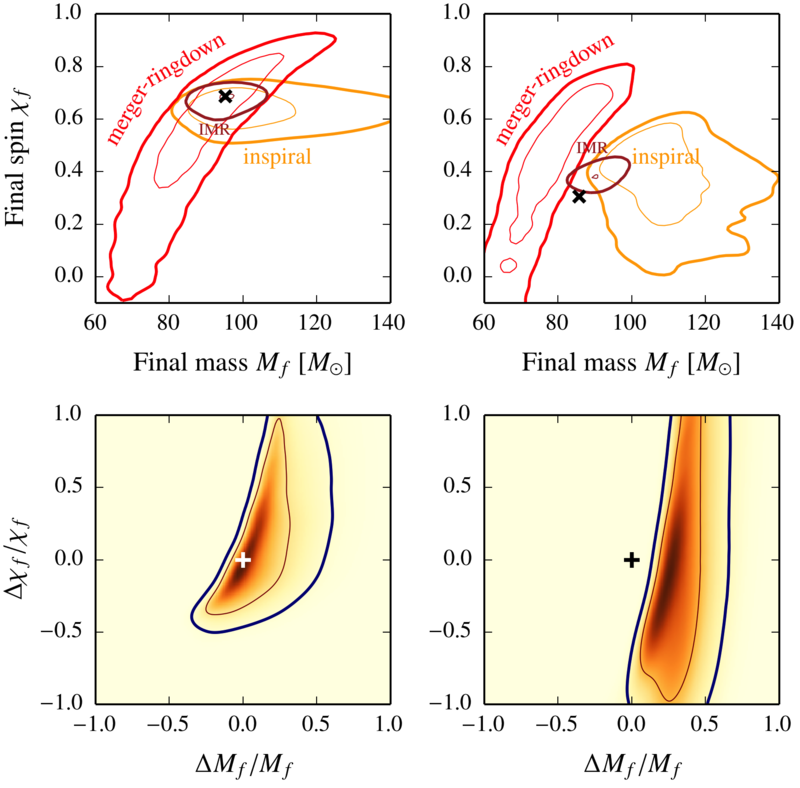 The plot on the left shows the masses of the progenitor stars when the form and the masses of the black holes they leave behind for systems compatible with the observations, for two different assumed metallicities. Authors: Stevenson, S., Vigna-Gómez, A., Mandel, I., Barrett, J. W., Neijssel, C. J., Perkins, D. & de Mink, S. E.
The increasing number of gravitational-wave observations promises to lead to insights into stellar binary evolution. One approach is to compare specific evolution models against observations; however, given the uncertainty in the models, a model-independent approach to astrophysical inference is desirable. In an earlier paper, we advocated clustering in a multi-dimensional parameter space. Here, we propose a practical procedure to clustering observations which are subject to significant measurement errors. We apply our method to a mock data set of population-synthesis predictions for compact binaries incorporating realistic measurement uncertainties. We demonstrate that a few tens of observations are sufficient to accurately distinguish subpopulations of sources! The example to the left shows what we could do with 160 observations, you can make out clusters for binary neutron stars (in the bottom left corner), neutron star–black hole binaries (along the edges) and binary black holes (in the centre). Authors: Mandel, I., Farr, W. M., Colonna, A., Stevenson, S., Tiňo, P. & Veitch, J.
Extreme-mass-ratio inspirals occur when a compact object, like a solar-mass black hole, orbits around a much larger one, such as the supermassive black holes found in the centres of galaxies. The gravitational waves emitted by these inspirals are a prime target for space-bourne detectors like LISA; they can complete tens of thousands of cycles, allowing us to make exquisite measurements of the system's properties. To detect and analyse these signals, we need waveform templates that are accurate over these long signals. Waveforms have been previously calculated using the adiabatic approximation, which averages the rate of inspiral over many orbits. This approximation breaks down if the radial and polar orbital frequencies are multiples of each other: the inspiral will pass through many such transient resonances as it evolves. We studied the effects of transient resonances on extreme-mass-ratio inspirals. The plot to the left shows the kick received (compared to the adiabatic approximation) when passing through the resonance. We found that for most inspirals the effect of resonance is small enough not to impact detectability, we'd still be able to find about 96% of signals with our adiabatic models! Resonances could still have a big impact on parameter estimation (possibly even improving measurements if we can model them properly), but this is something still to be investigated. Authors: Berry, C.P.L, Cole, R.H., Cañizares, P. & Gair, J.R.
Stellar-mass black holes of a few to a few tens of solar masses are known to exist, as are million to billion solar-mass behemoths. What about intermediate-mass black holes weighing in at a few hundred solar masses? It is difficult to convincingly observe these electromagnetically, but it may be possible to detect them using gravitational waves if they merge with other intermediate-mass black holes or stellar-mass black holes. In this study, we numerically investigate the dynamics of putative globular clusters that harbour intermediate-mass black holes. We include relativistic dynamics (for the first time incorporating terms up to 2.5 post-Newtonian order) in the vicinity of an intermediate-mass black hole. Our simulations show that the intermediate-mass black hole readily forms a binary with a stellar-mass black hole companion. This binary is gradually hardened (becoming more tightly bound) by transient 3-body or 4-body encounters. These also cause frequent substitutions of the black hole companion (as shown in the figure on the left). We find that one of the dozen clusters we simulated will have an intermediate-mass-ratio merger between an intermediate-mass and a stellar-mass black hole within 100 million years. Authors: Haster, C.-J., Antonini, F., Kalogera, V. & Mandel, I. The timing of radio pulsars in binary systems provides one of the best testing grounds of the predictions of general relativity. Traditional methods are based on least-squares fits that do not account for the actual structure of the likelihood function, and this can potentially bias the inference of the parameters of the binary system. 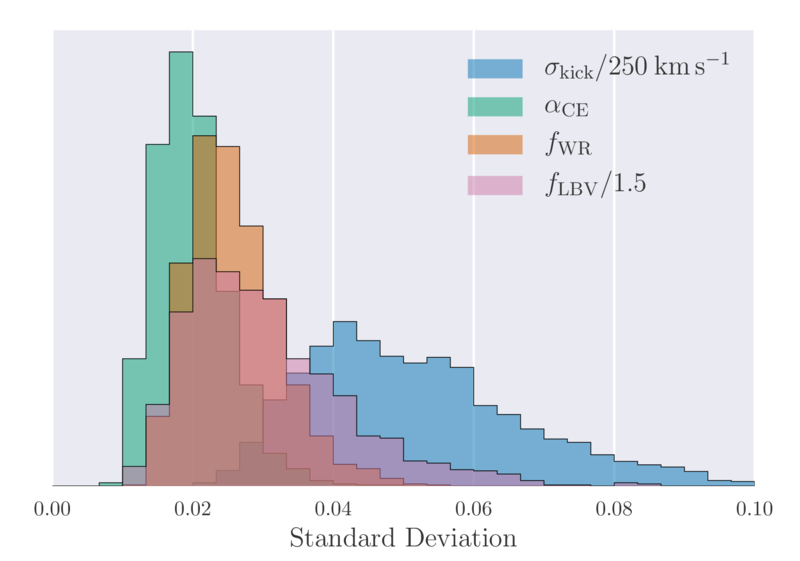 In this paper, we propose a Bayesian approach to carry out these tests of general relativity. Using simulated data sets that are representative of current observations, we demonstrate the power of this framework by (i) using the ratio of the evidences of two models to compare different theories of gravity; (ii) combining constraints from multiple systems to improve our constraints on any theory of gravity. The plot above shows probability distributions of a set of orbital parameters assuming different theories of gravity for a simulated system similar to the double pulsar. Applying our approach to real data will allow us to extract as much information as possible about the nature of gravity. Authors: Del Pozzo, W., & Vecchio, A. A golden black-hole binary is one where we can measure both the inspiral and post-inspiral (merger and ringdown) portions of the gravitational-wave signal. In this paper, we suggest using golden binaries as tests of general relativity, since they provide a glimpse of the strongest gravitational fields. We measure properties of the binary (we use the mass and spin of the final black hole), from the inspiral and post-inspiral parts of the waveform, and check for consistency. If our general relativity waveform models are correct, we should get compatible results from both, but a difference might hint at new physics. The test could be thought of as making measurements with two different instruments (the low frequency inspiral detector, and the high frequency post-inspiral detector), and seeing that they agree. 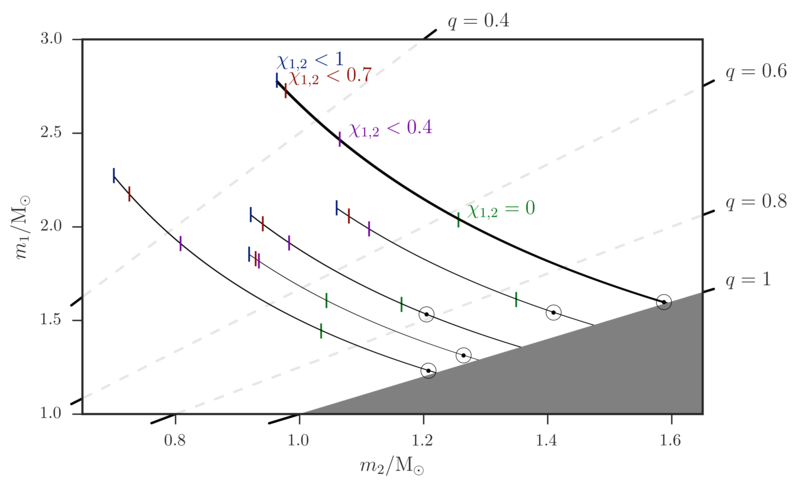 The plots on the left show an application of the test, the left panels show a general relativity signal with compatible estimates, and the the right shows a modified theory where the estimates are inconsistent. We find that the test is sensitive to some deviations that could otherwise be missed, and also has the advantage that we can combine results from many binaries to get a tougher test of Einstein's theory! This was one of the tests used for GW150914, and no inconsistencies were found. Authors: Ghosh, A., Ghosh, A., Johnson-McDaniel, N. K., Kant Mishra, C., Ajith, P., Del Pozzo, W., Nichols, D. A., Chen, Y., Nielsen, A.B., Berry, C. P. L. & London, L.
Binary neutron-star coalescences are one of the most exciting sources for Advanced LIGO. As well as emitting gravitational waves, their mergers may produce a burst of electromagnetic radiation. It is important that we understand how to analyse these signals and measure their parameters. In this study, we analysed a set of fake binary neutron-star signals and investigated how including the neutron stars' spins effected things. We expect that neutrons stars will rotate, but that their spins should be small. Including spins complicates the analysis and makes it much more computationally expensive (taking around 20 times as long), so it is often ignored. 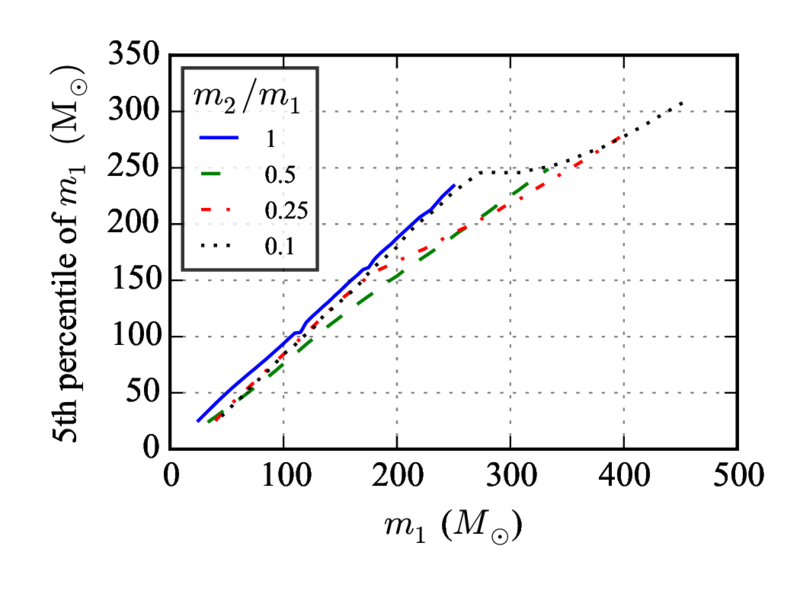 We find that allowing for spins increases uncertainty in measurements of the masses, as shown in the plot. Typical uncertainty of the total binary mass is around 6%, and on the chirp mass it is 0.06%, so even with the extra uncertainty, we can still make precise measurements! The sky localization is unaffected by the spin, so using the quicker results without spin is absolutely fine. Authors: Farr, B., Berry, C. P. L., Farr, W. M., Haster, C.-J., Middleton, H., Cannon, K., Graff, P. B., Hanna, C., Mandel, I., Pankow, C., Price, L. R., Sidery, T., Singer, L. P., Urban, A. L., Vecchio, A., Veitch, J. & Vitale, S.
The first observation of gravitational waves from a black hole binary, GW150914, has important consequences for the future of gravitational-wave astronomy beyond ground-based detectors. Because of its high mass (~30+35 solar masses), GW150914 would have been observable by a space-based gravitational-wave detector such as the planned eLISA. With eLISA, the system would have been detectable from several year up to few weeks before coalescence, as shown by the black line in the plot to the left. 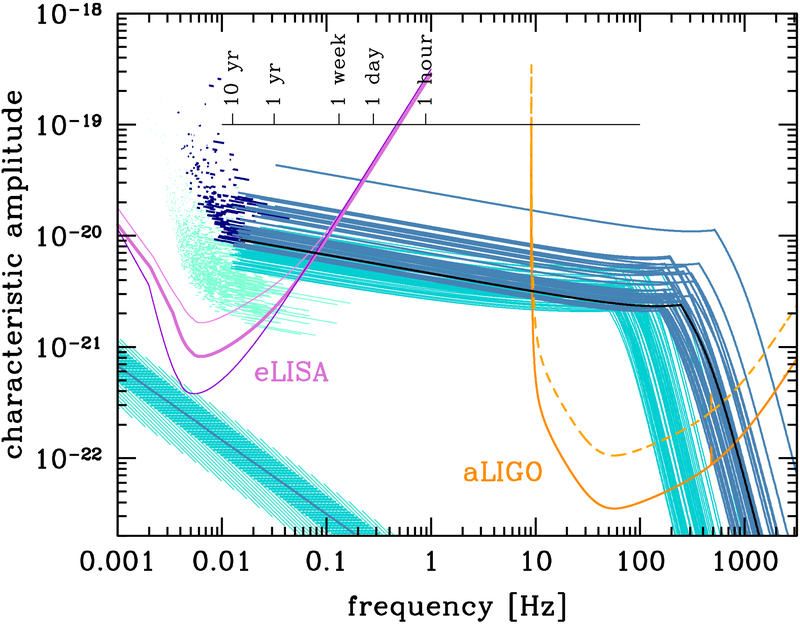 Merger rates inferred from the first aLIGO detections imply that up to few hundreds similar events would be observable both with eLISA and aLIGO in the future, opening the way to multi-band gravitational-wave astronomy. This has a number of outstanding consequences for astrophysics, tests of gravity and multimessenger astronomy. In particular, eLISA observations can inform aLIGO and electromagnetic telescopes about when and where in the sky black hole merger events are going to occur with several weeks' notice, allowing us to realise the full potential of coincident gravitational-wave and electromagnetic observations. Binary black holes, like the source of GW150914, are believed to be able to form in two different ways: isolated binary evolution and dynamically interacting binaries. The latter is expected to dominate in dense stellar environments such as globular clusters, and we show in this paper that GW150914 is consistent with coming from this formation channel. By simulating the gravitational interaction between hundreds of thousands of stars and black holes in a typical globular cluster, while also keeping track of each star's evolution, we can find how many binary black holes of a certain mass can form per cluster. One example of such a formation chain is shown in the figure on the left. 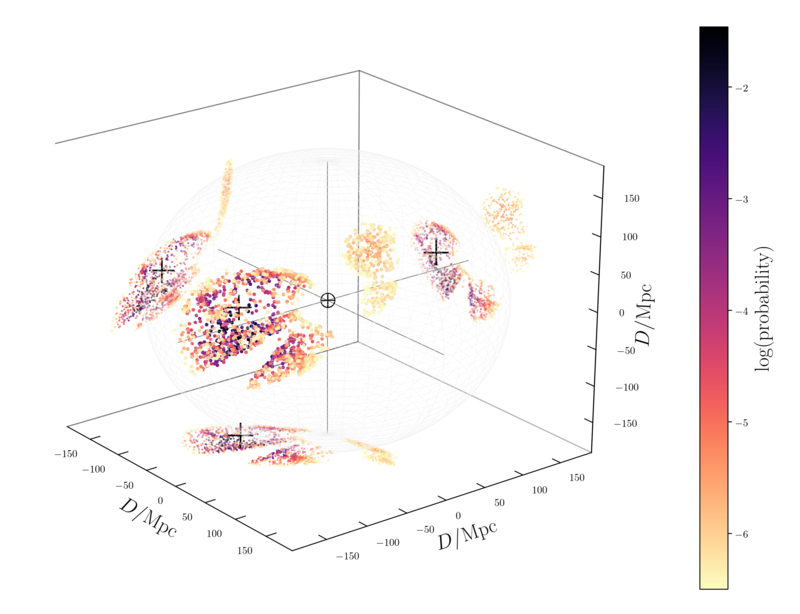 In this paper, we used 48 such cluster models, and after comparing our simulation with observations of globular clusters across the Universe we can calculate how many binary black hole mergers are expected to be produced in globular clusters. Combining this result with how well Advanced LIGO is able to detect gravitational waves from these mergers tells us how often we should be able to observe a binary black hole merger from a globular cluster. We show that the detection of GW150914 is consistent with the masses and merger rates expected for binary black hole from globular clusters. Dynamical processes provide a significant (and well understood) pathway for forming binary black hole mergers in the local Universe. Understanding how binary black hole systems form is one of the key questions for gravitational-wave astronomy. Authors: Rodriguez, C. L., Haster, C.-J., Chatterjee, S., Kalogera, V. & Rasio, F. A. Merging stellar-mass binary black holes, such as those recently observed by LIGO, could arise from several possible formation channels. These can be broadly split into two categories: isolated binaries and dynamically interacting binaries (in dense stellar environments such as globular clusters). The isolated binary channel was previously expected to require several episodes of mass transfer, where material is transfered from a star to its partner as it puffs up towards the end of its life, and a common envelope phase where so much material is shared by the stars that their cores orbit inside a combined outer layer. Stars normally expand as they evolve, but this is not so if the stars are rapidly rotating and subject to strong tidal forces. Massive, low-metallicity stars in compact binaries will be efficiently mixed, leading them to evolve chemically homogeneously. As a consequence, they shrink as they age and avoid mass transfer altogether, forming black holes in situ. 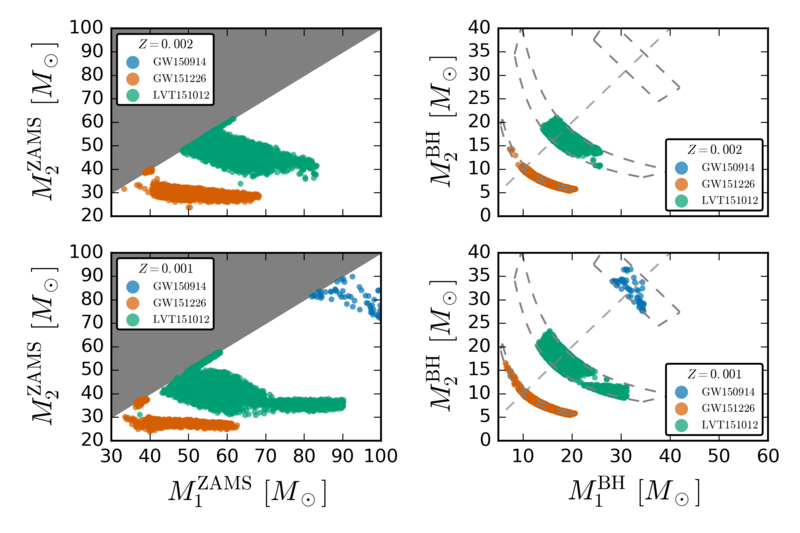 In this paper and its follow-up, we show that chemically homogeneous evolution represents a viable formation channel for heavy black hole binaries, with plausible local merger rates of order 10 per Gpc3 per year. The resulting black holes are nearly equal mass, each about 25 to 55 solar masses, with time delays of 4 to 10 Gyr between formation and merger. 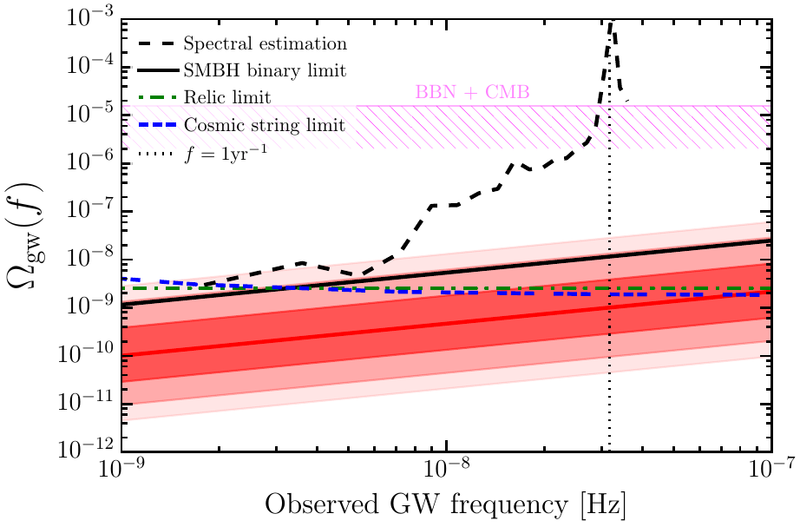 We show that the advanced gravitational-wave detectors at design sensitivity could observe hundreds of events per year from this channel, and that GW150914's source is consistent with having been formed this way. Authors: Mandel, I. & de Mink, S. E.
Intermediate-mass black holes are an elusive class of black holes with masses between stellar-mass black holes (which have masses up to a few tens of solar masses) and supermassive black holes (ten of thousands of solar masses). There is no reason why there should not be any black holes in this intermediate-mass regime; however, we are yet to find any conclusive proof for their existence. If an intermediate-mass black hole and a stellar-mass black hole could form a binary, which is expected to commonly occur in dense stellar environments (such as globular clusters), and this binary merged from emission of gravitational waves then it could be detectable by LIGO. This type of signal would be expected to be very short and only exist at the low-frequency end of LIGO's sensitivity. Therefore, it might be expected that we could not measure much about the source binary; in this paper we show that this is not the case! We find that we can confirm the existence of an intermediate-mass black hole (with mass greater than 100 solar masses) with 95% confidence provided the massive body exceeds 130 solar masses, as shown in the figure on the left. Like for intermediate-mass black hole binaries, we find that systems with total mass above ~200 solar masses, the best measured parameter is the frequency of the ringdown of the black hole formed after the merger, as it's settling down into its final state. Consequently, these binaries have a well constrained total mass, whereas lower mass binaries are better described by their chirp mass. The mass of the stellar-mass companion is only measured well during the inspiral phase, which further highlights the importance on reliable low-frequency detector sensitivity. Authors: Haster, C.-J., Wang, Z., Berry, C. P. L., Stevenson, S., Veitch, J. & Mandel, I. When we analyse a gravitational-wave signal with our parameter-estimation codes, we need accurate templates for the waveforms. If the template is imperfect (because it does not include all the relevant physics, it relies upon an approximation or it is from a simulation with finite numerical accuracy) it could produce errors in our inferred parameters. 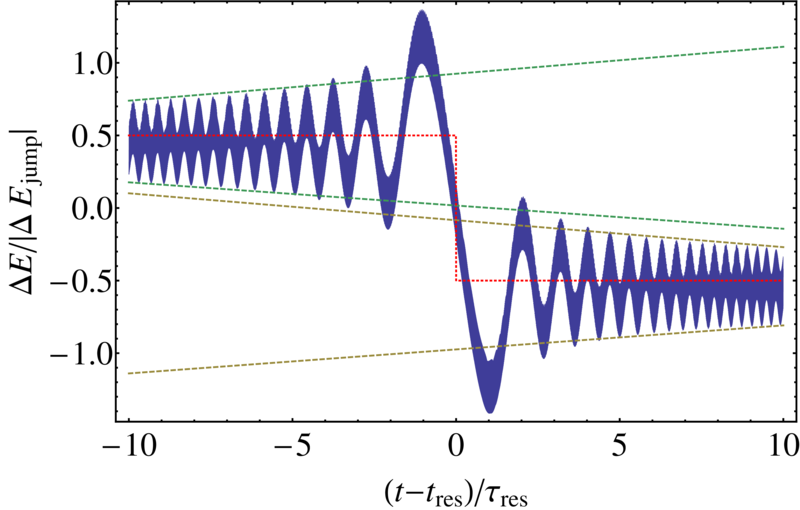 This theoretical uncertainty is the dominant source of error for loud signals. In this paper we introduce a means to include waveform uncertainty in parameter estimation. This could be useful, for example, if you have a few highly accurate waveforms, but they are too expensive to calculate for all the parameter values needed in the analysis. Our technique is based on Gaussian process regression (GPR), which is a flexible way of interpolating functions—in our case waveforms. We give a detailed introduction to GPR. The plot above shows how using GPR can account for the effects of waveform uncertainty: the black curves show results using a perfect waveform, the orange curves show results with an inaccurate waveform and the blue curve shows the results with the inaccurate waveform and GPR. 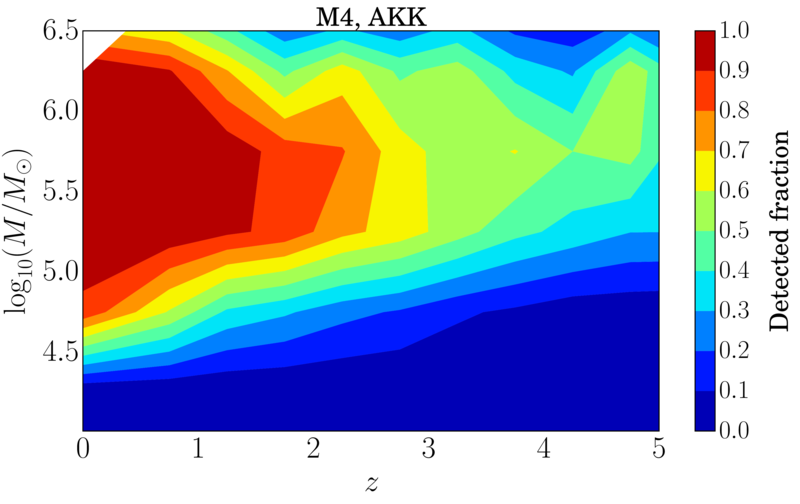 GPR can remove bias and incorporate theoretical uncertainty (broadening distributions). Authors: Moore, C. J., Berry, C. P. L., Chua, A. J. K. & Gair, J. R.
Laser beams are used in some of the most precise displacement measurements possible. The laser light is manipulated in devices known as interferometers designed for these measurements. Although precisely constructed, small defects in the components can greatly alter the measurement result. Such defects act to scatter the laser light from an ideal shape and so degrades the performance. Numerical models are used to construct virtual interferometers to analyse how these effects can be corrected or reduced in new instrument designs. However, the computational cost of calculating this scattering can severely limit the usefulness of the models. Our paper outlines a method that provides a thousand-fold improvement in the speed of this computation. The dominant fraction of the computational cost comes from the evaluation of integrals describing the distortion of the laser beam. These are evaluated whenever the laser changes shape, for example, when optics heat up and expand. Our new, faster computational method can solve these integrals by making use of a technique known as reduced-order quadrature (ROQ). It generates a near-optimal application-specific integration rule for Hermite–Gauss beam modes (for a user-defined accuracy). The thousand-fold increase in performance demonstrated in this work (shown in the plot) opens up new areas of design explorations and optimisation which were practically off-limits before. Authors: Brown, D., Smith, R. & Freise, A. At the centre of many galaxies there is a massive black hole, millions to billions of times the mass of our Sun. When galaxies merge with each other, their black holes will form a binary and emit gravitational waves. Galaxies are merging all over the Universe, so we expect to see many overlapping signals forming a gravitational-wave background at nanohertz frequencies. How can we search for this background? Pulsars are the lighthouses of the Universe. They are spinning neutron stars from which we see a pulse of radiation each rotation, and can be used as accurate clocks. Gravitational waves change the arrival times of the pulses from a set of pulsars in a characteristic way. Many international groups are searching for this evidence. So far no signal has been seen, but as pulsars are timed for longer and longer, our sensitivity improves. As a signal has not been found yet, we know that the gravitational-wave background must be smaller than the level we could detect and this sets an upper limit on the strength of the background. But what can we learn about the massive black-hole binaries themselves using pulsar timing? Are there lots of large black holes merging far away from Earth or a few (relatively) small black holes merging close by? We use a simple model which can describe a plethora of possibilities for the distribution of binaries in mass and redshift to find out what we can learn about the population. Using the best result from pulsar timing, and some mock results for possible future upper limits and detection, we investigate what information pulsar timing holds. Our main results are shown in the figure which shows results for three different pulsar timing scenarios (the current upper limit, a possible future upper limit, and detection) and some model predictions. 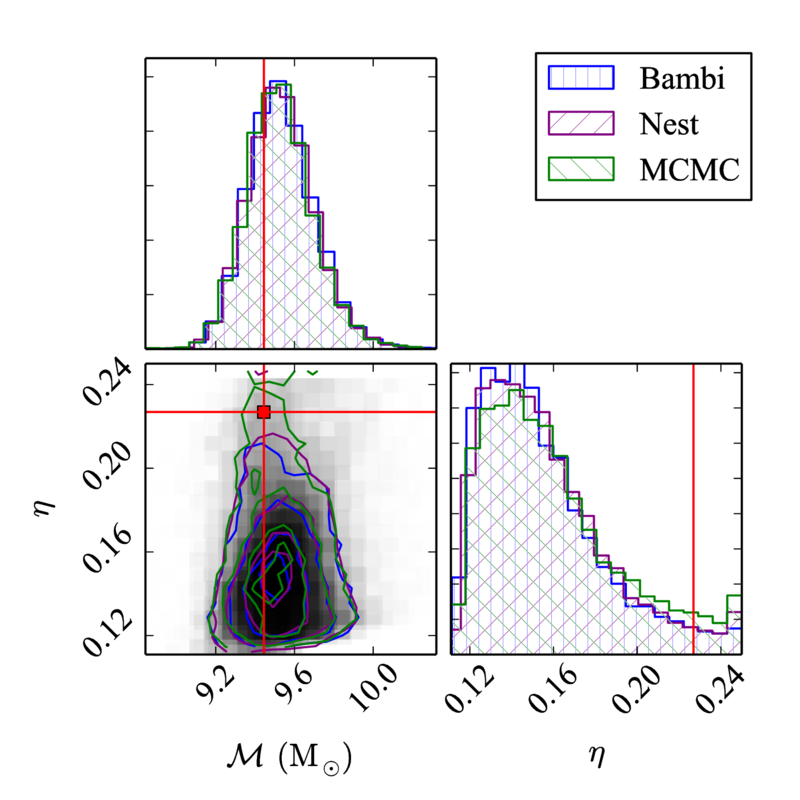 We show distributions of sources in chirp mass M and in redshift z. The grey bands in the plot indicate what can be learnt from pulsar timing alone—without relying on any particular model prediction (green). 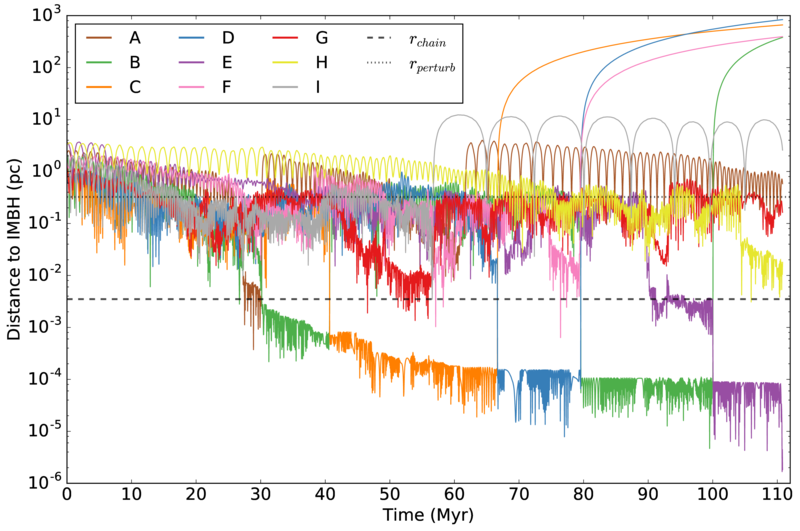 The wide bands in the plot mean that the distribution is poorly constrained—we are unable to tell the distribution of masses or the redshift of the sources as many different possibilities are contained within these bands (dashed lines). However, what we can learn is the number of mergers taking place. For an upper limit we can place a maximum cap on the number of mergers, and for a detection we will be able to place a range on the number because we see that these binaries do indeed merge! Authors: Middleton, H., Del Pozzo, W., Farr, W. M., Sesana, A. & Vecchio, A. According to Einstein's general theory of relativity, gravitational waves change the physical distance between spatially separated objects as they passing by. Such an effect is directly proportional to the initial distance of these objects—the larger the distance between the objects before the gravitational wave, the larger the change. That is why current gravitational-wave detectors are large-scale laser interferometers with kilometre arm lengths. To further increase the effective arm length, we introduce optical cavities, where the light bounces back and forth many times, to the interferometer that Michelson first invented in late 19 century. A schematic is shown on the left. However, the light is not able to instantaneously follow the arm length change induced by gravitational waves because it travels at a finite speed. Particularly for high-frequency gravitational-wave signals, the arm length of the interferometer changes so fast that the light will not able to follow, which results in a reduced signal strength from the interferometer. This means that the detector has lower sensitivity to these high-frequency gravitational waves. In this paper, we discuss a new approach to recover the high-frequency sensitivity by embedding an additional optical component, called an unstable filter (also shown in the figure). Qualitatively, the unstable filter enhances the detector response to high-frequency signals, resulting in an overall enhancement of the detector sensitivity across a broad frequency band. Authors: Miao, H., Ma, Y., Zhao, C. & Chen, Y.
Millisecond pulsars are the most stable clocks in the Universe, and can be used to probe extremely tiny variations in the spacetime metric caused by to gravitational waves. 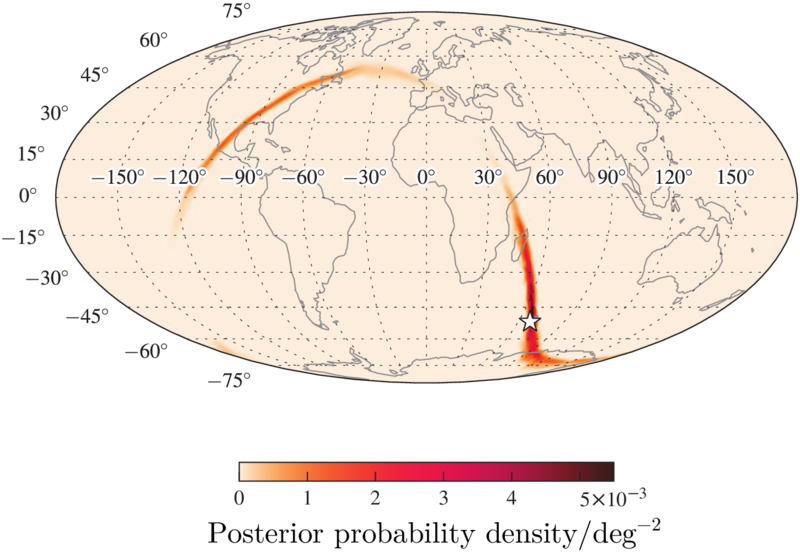 The passage of a gravitational wave squeezes and stretches the space so that the distance between the Earth and the pulsar is changing in time, causing a variation in the time of arrival of the pulses. By cross-correlating timing data of a ensemble of pulsars (a pulsar timing array), gravitational waves in the nanohertz frequency regime emitted by supermassive black hole binaries or cosmic strings and exotic processes in the early Universe, can in principle be observed. The European Pulsar Timing Array is one of the three international collaborations searching for these waves, and in this paper we employ the most advanced data analysis techniques on high quality pulsar timing data to search for gravitaional waves. The figure on the left shows the results of our search, expressed in terms of energy density in gravitational wave (the Omega parameter) versus frequency. The black dashed curve is the limit we can put on the gravitational-wave energy density at each frequency. The straight lines show how this converts into a limit on the stochastic background generated by different sources (relic waves from the early Universe, cosmic strings, and supermassive black hole binaries). 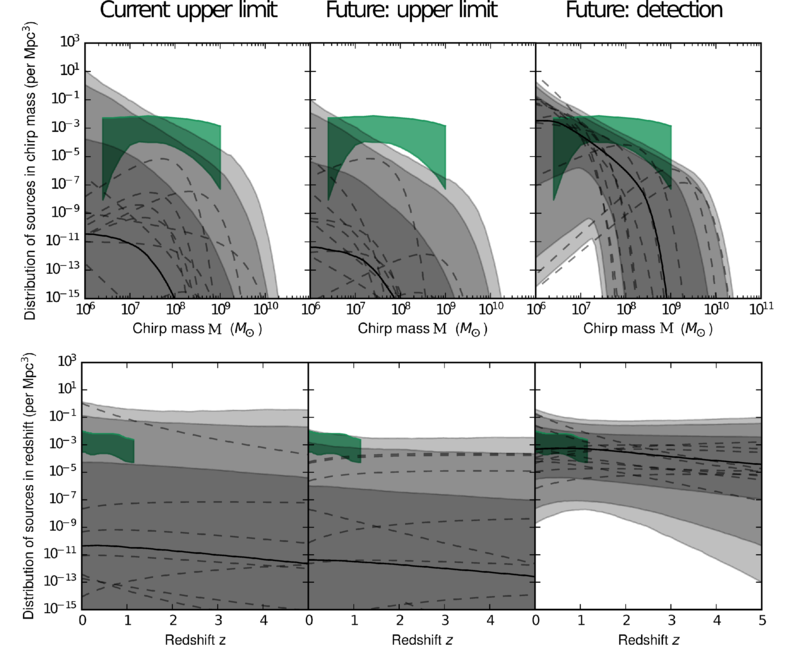 For black hole binaries, the limit is starting to skim through the region predicted by cosmological models (the red area). By observing longe) and adding pulsars to the array, our sensitivity is bound to increase, and pulsar timing arrays are expected to soon detect gravitational waves from these cosmological monsters. Authors: Lentati, L., Taylor, S. R., Mingarelli, C. M. F., Sesana, A., Sanidas, S. A., Vecchio, A., Caballero, R. N., Lee, K. J., van Haasteren, R., Babak, S., Bassa, C. G., Brem, P., Burgay, M., Champion, D. J., Cognard, I., Desvignes, G., Gair, J. R., Guillemot, L., Hessels, J. W. T., Janssen, G. H., Karuppusamy, R., Kramer, M., Lassus, A., Lazarus, P., Liu, K., Osłowski, S., Perrodin, D., Petiteau, A., Possenti, A., Purver, M. B., Rosado, P. A., Smits, R., Stappers, B., Theureau, G., Tiburzi, C. & Verbiest, J. P. W.
Current electromagnetic observations provide evidence for black holes a few times more massive than the Sun, as well as behemoths millions of times more massive than the Sun. Intermediate-mass black holes weighing in at hundreds of solar masses are suspected to exist, but are extremely difficult to find electromagnetically, and none have been confirmed to date. In this paper, we used some of the analysis techniques we have developed within the LIGO Scientifitc Collaboration to demonstrate that gravitational-wave observations could be used to accurately measure masses of black holes in merging binaries and probe the existence of intermediate-mass black holes. We found that (i) at total masses below ~200 solar masses, where the signal-to-noise-ratio is dominated by the inspiral portion of the signal, the chirp mass can be accurately measured; (ii) at higher masses, the information content is dominated by the ringdown and total mass is measured more accurately; (iii) the mass of the lower-mass companion is poorly estimated, especially at high total masses and more extreme mass ratios, and (iv) spin cannot be accurately measured for non-spinning components. Most importantly, we found that for moderately loud signals from systems with non-spinning components, an analysis that allows for aligned spins confirms the existance of an intermediate-mass black hole (with mass >100 solar masses) with 95% confidence in any binary that includes a component with a mass of 130 solar masses or greater (as illustrated in the figure on the left). Authors: Veitch, J., Pürrer, M. & Mandel, I. Advanced LIGO is due to begin the hunt for gravitational waves from colliding black holes, with Advanced Virgo joining later next year. Black holes are the remains of stars with masses tens of times the mass of the Sun. For two of these black holes to collide, they need to live and die as a pair, or a binary. These stars lead spectacular lives as they constantly shed mass in stellar winds, violently strip mass from one another, explode as supernova, and even engulf one another (what is known as a common envelope event). Most of these processes have so far been studied using systems we can see, such as X-ray binaries (a black hole eating a normal star), but remain poorly understood. However, these processes also leave an imprint on the masses of the black holes. Therefore, by comparing the distribution of masses of binary black holes that Advanced LIGO and Advanced Virgo find with a prediction from a model, we can learn about these extreme evolutionary processes and the lives of massive stars. The chequerboard type plot shown on the left compares simulated observations from each model in a set of models to all of the others in turn. Darker squares indicate that models are similar, and lighter squares indicate that we can tell models apart. The dark strip on the diagonal shows that models do look like themselves. Since there are lots of lighter squares, it is possible to distinguish between many models. We should be able to learn lots about binary evolution over the next couple of years! Authors: Stevenson S., Ohme, F. & Fairhurst, S.
Stars that get too close to massive black holes get shredded by the strong gravitational fields in spectacular tidal disruption events. In this paper, we explored what happens to stars in a binary which approaches a massive black hole on a deeply penetrating trajectory where the binary can move directly into the region where individual stars are tidally disrupted. We found that the interaction with the massive black hole often leads to both stars being disrupted in sequence. Such events could produce light curves that are substantially different from those of the single disruptions, with possible features such as two peaks (a possible light curve is shown on the left). Tidal forces from the massive black hole can also lead the binary components to collide; these merger products can form highly magnetized stars, whose subsequent tidal disruption may enable prompt jet formation, something that has been observed but is difficult to explain with existing models. Authors: Mandel, I. & Levin, I. The first observing run (O1) of Advanced LIGO is expected later in 2015; we must have our data analysis algorithms prepared in anticipation of this. To check the how well we would be able to measure things in O1, we created a set of binary neutron-star signals (which are expected to be the main source for Advanced LIGO and hid these in noise. This noise was created using real data from initial LIGO to capture all the interesting (and troublesome) features. Our fake set of data was analysed as real data would be, passing through the detection pipeline before detected events were analysed with parameter-estimation codes. We checked how well we could measure position on the sky (which is important for pointing telescopes in case the merger of the neutron stars is accompanied by an explosion), distance to the source and the chirp mass (the combination of component masses we're most sensitive to). Uncertainty in sky position is typically about 600 deg2 (an example sky map is shown on the left), which will make it difficult to cover all the area. However, our fastest code (BAYESTAR) can calculate this in under a minute, so it is possible to start looking straight away! The distance is also quite uncertain, with typical uncertainties being tens of percent, but the chirp mass is well measured, with an accuracy typically about 0.00025 of a solar mass. To work out the individual masses, we need to include the effects of spin, which slows down the analysis: we are currently working on these results. Authors: Berry, C. P. L., Mandel, I., Middleton, H., Singer, L. P., Urban, A. L., Vecchio, A., Vitale, S., Cannon, K., Farr, B., Farr, W. M., Graff, P. B., Hanna, C., Haster, C.-J., Mohapatra, S., Pankow, C., Price, L. R., Sidery, T. & Veitch, J. How do extract information from a gravitational-wave signal about its source? We are often interested in what we can learn about astrophysical systems from gravitational-wave observations. Over many years, we have worked as part of the LIGO Scientific Collaboration to develop a set of algorithms that can analyse gravitational-wave signals from compact binary coalescences (the inspiral and merger of binaries made up of neutron stars or black holes), and infer the parameters that describe the source (such as the components' masses and spins, the orientation of the binary and its location). This software library is known as LALInference. Given a measured signal, we can calculate how well it is matched by a template gravitational wave calculated with a particular set of parameters. The better the template fits, the more probably that the true signal had those parameters. We also use Bayes' theorem to fold in any prior information we have about the parameters. We are interested in mapping the probability distribution. LALInference does this by randomly sampling parameter space (using techniques such as Markov-chain Monte Carlo and nested sampling), at each point matching a template to the data. 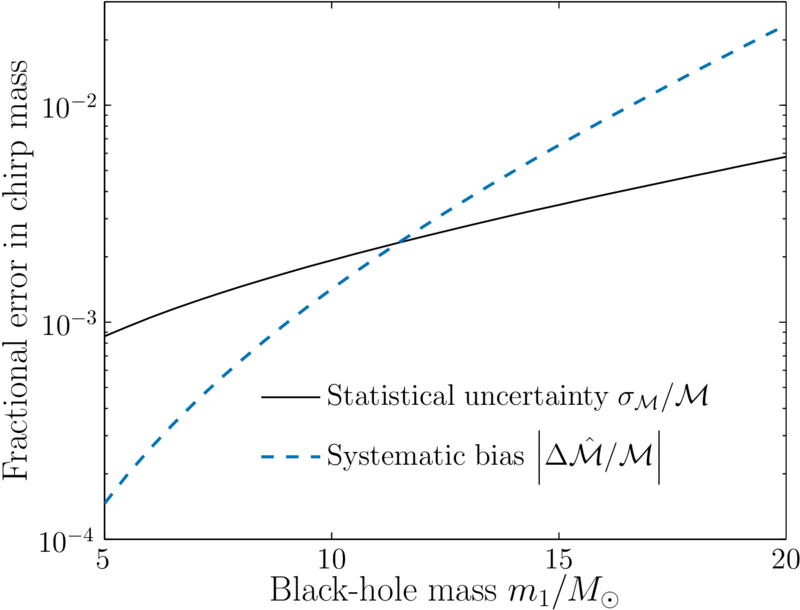 Doing this allows us to find the most probable parameter values, estimate our uncertainty and build up a complete picture of possible parameter combinations; an example probability distribution for the mass paramters of a black-hole binary is shown on the left. This process is computationally expensive, so LALInference features many techniques to help speed things up: we are still working on improvements here! Hopefully, Advanced LIGO and Advanced Virgo will soon detect a gravitational wave from a compact binary coalescence, LALInference will then tell us what we can learn about the source system. Authors: Veitch, J., Raymond, V., Farr, B., Farr, W., Graff, P., Vitale, S., Aylott, B., Blackburn, K., Christensen, N., Coughlin, M., Del Pozzo, W., Feroz, F., Gair, J., Haster, C.-J., Kalogera, V., Littenberg, T., Mandel, I., O'Shaughnessy, R., Pitkin, M., Rodriguez, C., Röver, C., Sidery, T., Smith, R., Van Der Sluys, M., Vecchio, A., Vousden, W. & Wade, L.
This article explains some of the conventions used in gravitational-wave astronomy to characterise the sensitivities of detectors and the amplitudes of signals. Several different conventions are commonly in use (which can lead to confusion), each with their own beneficial properties. (i) The characteristic strain (as shown in the figure to the left), is closely related to the signal-to-noise ratio (how loud a signal is). On a log–log plot, the signal-to-noise ratio is the area between the detector's sensitivity curve and the top of the source box. (ii) The power spectral density is a measure of the sensitivity of the detector. It gives a measure of the average noise in the detector. (iii) The energy density is directly related to the energy carried by a gravitational wave. This quantity is often used by cosmologists to measure the contents of the Universe. The paper explains how to convert between these different quantities, and gives approximate values for the sensitivities of a range of detectors as well as the amplitudes for a range of possible sources. Accompanying this article is a website where you can create your own sensitivity-curve plots. Authors: Moore, C. J., Cole, R. H. & Berry, C. P. L.
The gravitational wave signal from a coalescing binary is complicated to calculate. The early inspiral can be modelled with post-Newtonian expansion. The subsequent merger must be found numerically. This has only recently become possible for binary black holes, and is still uncertain for neutron star–black hole binaries and binary neutron stars. To avoid the uncertain merger, many analyses truncate the gravitational wave template at the end of the inspiral. However, this paper explains how this practice can lead to misleading results! If the cut off point (say at the innermost stable orbit) depends on the parameters (like mass and spin), then the sharp termination of the waveform introduces extra information. This would not be present for real signals, which don't abruptly stop. If cut off waveforms are used for both the signal and the template, the extra information leads to misleadingly good parameter estimation accuracies. These scale inversly with the square of the signal-to-noise ratio (SNR), rather than the usual inverse of the SNR, making the effect worse for louder signals. If a cut off waveform is used for the template when the signal does include merger, then the parameter estimates can be biased. 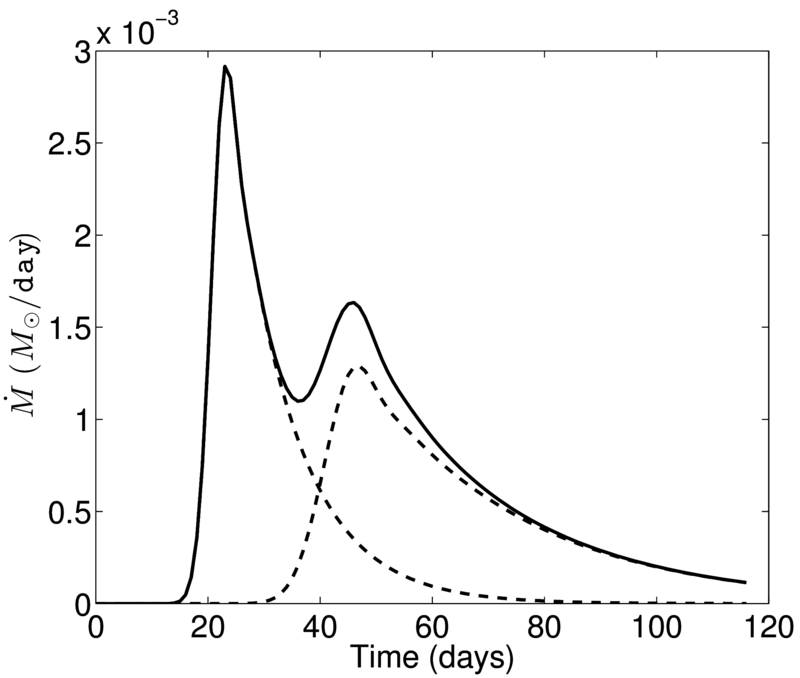 The plot on the left shows when this systematic error dominates over statistical uncertainty for a neutron star–black hole signal with SNR of 10. Full waveforms including merger should be used wherever possible, and if waveforms need to be cut, this must be done at a fixed frequency, rather than one which depends upon the template's parameters! Authors: Mandel, I., Berry, C. P. L., Ohme, F., Fairhurst, S. & Farr, W. M.
Advanced LIGO is currently the most sensitive gravitational-wave detector in the world. We are now at a stage where the quantum noise, arising from vacuum fluctuations of the electromagnetic field, sets the sensitivity limit over most of the detection band. Can we bring the kilometre-scale detectors beyond the quantum limit of light while retaining their dual-recycled Michelson configuration (combining power-recycling and signal-recycling mirrors)? We investigated a new configuration that introduces additional optical filters inside the signal-recycling cavity (between the main interferometer and the signal-recycling mirror), as shown on the left. 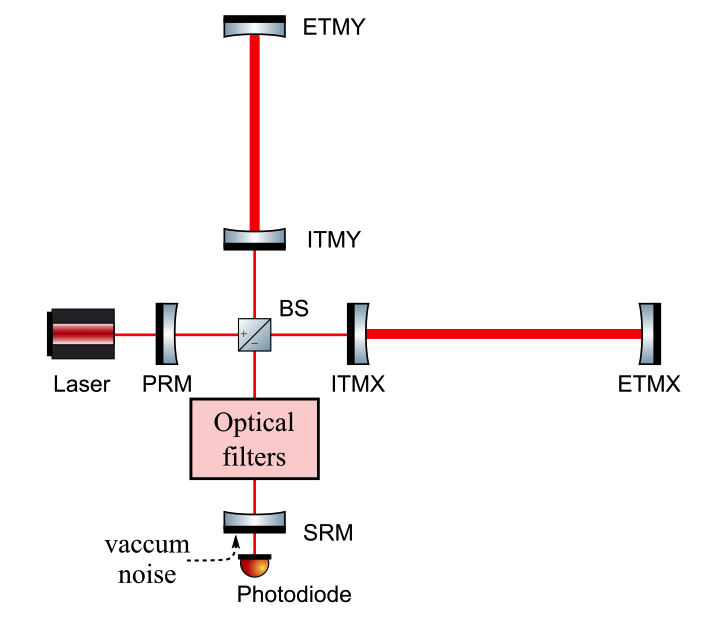 Optical filters can coherently feed the signal back to the interferometer with the proper frequency-dependent phase, resulting in different quantum-noise behaviours depending on the filter-cavity parameters. By adding these intracavity filters, a gravitational-wave detector can be tuned from being a pure position meter, to being partially a speed meter. 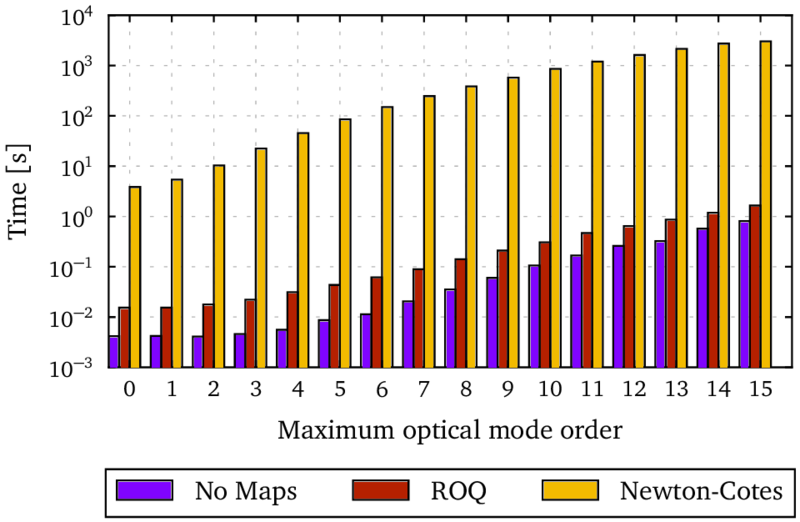 Additionally, our optimisation of the intracavity filtering scheme suggested that it is as good as frequency-dependent input filtering in reducing quantum noise over a large frequency band. Authors: Wang, M., Miao, H., Freise, A. & Chen, Y. The configuration of the Michelson interferometer was initially chosen for gravitational-wave detectors as it naturally sees gravitational-wave signals, directly outputting displacement differences between two perpendicular arms. The Sagnac interferometer was not as appealing to the gravitational-wave community until it was demonstrated that a zero-area Sagnac could potentially reach the required sensitivity to measure gravitational waves. The Sagnac interferometer, functions as a speed meter, which has excellent quantum-noise behaviour at low frequencies with only a little susceptibility to optical losses. 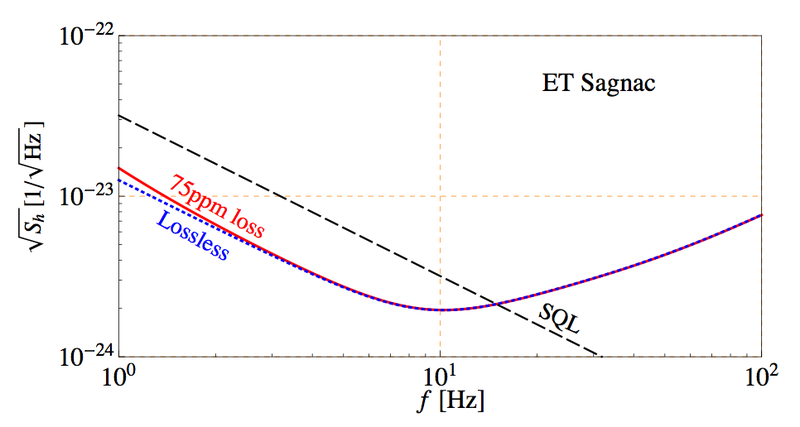 As illustrated in the sensitivity-curve plot on the left, the low-frequency quantum noise of a Sagnac interferometer can be below the standard quantum limit (SQL), which would be unachievable for a Michelson interferometer without using more advanced techniques like frequency-dependent squeezing! This advantage encourages considering the Sagnac interferometer as a practical alternative for future gravitational-wave detectors such as the Einstein Telescope. Authors: Wang, M., Bond, C., Brown, D., Brückner, F., Carborne, L., Palmer, R. & Freise, A.